Description: Saturday mornings were made for this! You can't go wrong with fresh air and a little exercise while on a guided tour of the Gardens. Join Dr. Richard and Patricia Ryel for a walk on our grounds to catch a glimpse of the beautiful birds that are migrating through the area. 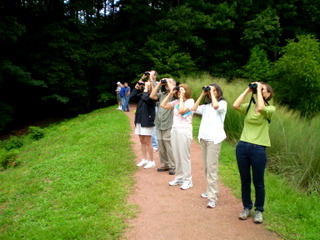 Over 100 different species have been spotted in the Gardens during past bird watching events. This monthly members-only event is free, but we do ask that you kindly RSVP. This is the last scheduled bird watch for 2018. This form stopped accepting submissions on November 17, 2018 8:00 am CST.